In an ironic twist that would only be lost on Alanis Morissette, a new luxury hotel has opened its doors in the republic of Georgia … in a Soviet-era building named for the founders of communism. 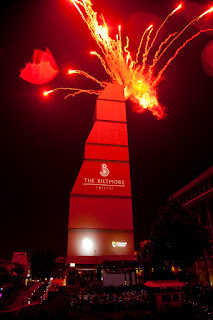 To the accompaniment of a fireworks and laser show and concert, the upmarket Biltmore Hotel Tbilisi was unveiled to an audience of over 5,000 people who gathered outside the former Institute of Marx, Engels and Lenin (IMELI) on the evening of July 31. Developed by U.A.E.-based Dhabi Group, the 32-floor hotel will be operated by Millennium & Copthorne and is its first property in Georgia. Located at 29 Rustaveli Avenue, close to the banks of the river Mtkvari, the hotel’s location is being called the most prestigious address in the city. “The Biltmore Hotel Tbilisi delivers a new level of bespoke luxury hospitality, set within a remarkable space with unparalleled design inspired by Georgia’s rich history,” Sami Edward, CEO of Dhabi Group, said in a statement. Construction of the original Soviet-era building, designed by the same architect who designed Lenin’s Mausoleum in Red Square, began in 1934 and took two years to complete. Once finished, the Institute of Marx, Engels and Lenin operated until the collapse of the Soviet Union. Over the several years that followed, it was used by Georgia’s government for a variety of purposes and even served briefly as the Ministry of Foreign Affairs. Unrest in the republic during the late 20th and early 21st centuries took a toll on the building, both physically and economically. The structure was heavily damaged by shelling and looting during the civil wars in Georgia in the early 1990s, and the original investors who had planned to turn the site into a luxury hotel in 2006 pulled out of the project following the five-day war between Russia and Georgia in 2008. The Dhabi Group took over and saw the project to its completion. Today, guests enter an immaculately restored grand lobby with sweeping staircases, vaulted ceilings, polished marbled floors and crystal chandeliers. A glass walkway connects the past to the present, taking guests to the contemporary portion of the hotel, with sleek contemporary décor providing a unique juxtaposition. The contemporary portion of the hotel includes the newest addition to the Tbilisi skyline, a 32-story glass skyscraper that was added to the historical building. That change represents “[M]arrying Georgian tradition and modernism,” according to the company. Guests at the hotel will eventually be able to choose from six restaurants and lounges that are set to open in the coming months, including a rooftop restaurant that offers panoramic views of the city’s skyline, Mediterranean-inspired al fresco dining, an all-day international restaurant and an elegant bar. Other highlights at the hotel include a health club with indoor swimming pool and fully-equipped gym, a luxurious spa, a ballroom, conference room and four meeting rooms. Guests can select from eight room categories, up to the Royal Suite, which developers say is the first presidential-class suite in Tbilisi. Situated in the heart of the capital city, the Biltmore Hotel Tbilisi is surrounded by chic designer boutiques, art galleries and a wealth of historical and cultural attractions as well as commercial and government buildings. More information is available and reservations can be made at the hotel’s website.